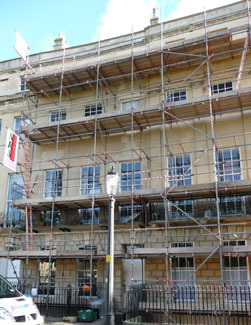 There follows a picture gallery of the damage that is being done by scaffolding companies to the buildings of Bath. 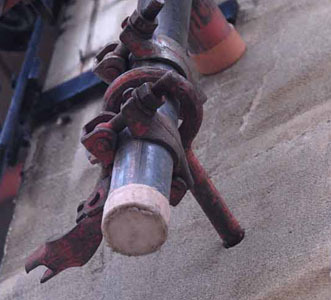 No explanation has been given for this relatively modern trend, when in the past such companies have always managed to anchor scaffolding by less intrusive measures. A conversation with a scaffolding contractor (who along with his company remains nameless because it would be unfair to single out any one example) revealed that he was following "standing instructions". 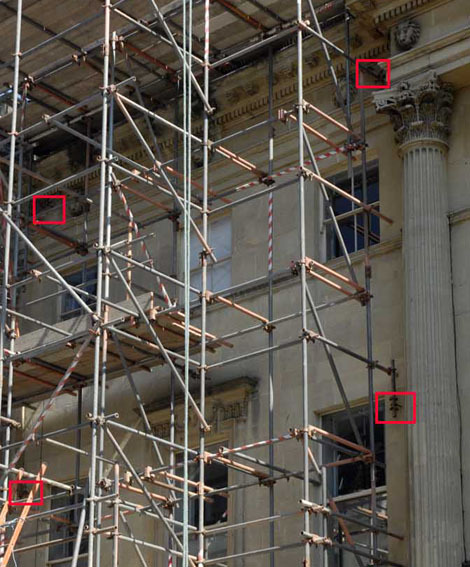 To give a balanced picture, at the bottom of the page are examples where companies have secured scaffolding without damaging the stonework. These are identified by not drilled in the Quick Finder. BS5973 is an extant standard on scaffolding safety, which advises on what resistance to twisting pressures from the wind must be withstood, and it is supported by TG20:08 which provides the mathematics for validating that. 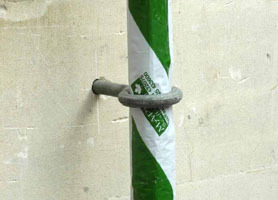 Although these standards refer to "ties", these can be adequate bracing and wedging and there is no absolute requirement to drill into the stonework for mechanical fixings. In the event of scaffolding collapse we will make these photographs available to any Health and Safety investigation. Furthermore, BS5973 specifically warns that if fixings to the facade are proposed "it is also crucial to assess whether the building fabric can support such loadings", and we have been photographing buildings where drilled fixings have been used, where this assessment should have ruled out such fixings. English Heritage produced guidance on scaffolding dated 1995. Although fixing to the stonework is included among the possible methods, the advice emphasises that it must be established that the structure is sufficiently sound before opting for this method, and the indications are than none of the examples listed here made that preliminary step. We have asked English Heritage to clarify whether intrusive methods of fixing such as drilling the stonework require Listed Building Consent, but no answer has been received yet. In some of the pictures, the scaffolding company can be identified, but we stress that these are not the only offenders, nor is every installation of scaffolding from any given company installed by drilling into the buildings scaffolded. But we do believe that it is an unacceptable practice which needs to stop. In exceptional circumstances where there is no possible alternative, a listed building application should be submitted and consent obtained before any drilling takes place. • No new holes can be drilled, but any existing hole can be reused provided it can provide a safe anchorage. • Holes that already contain an anchor can have that anchor reused. 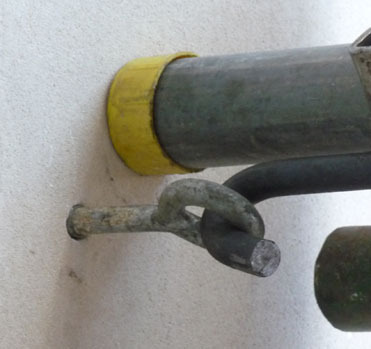 • Holes that are empty if used must use a particular type of temporary anchor that grips by the compression of a Chloroprene (a type of synthetic rubber) sleeve, and is removable. These must be removed when the scaffolding is dismantled. • Holes must be left uncapped when no longer in use. It was explained that capped holes retain water, which is likely to cause more long term damage than uncapped holes where moisture can evaporate. As a result of this information, we will no longer monitor council owned buildings because Property Services are already protecting them from scaffold damage. Nor will we concern ourselves with visible existing holes, because these have been left visible for a reason. This time we are examining the damage left behind when the scaffolding that is attached to buildings without planning permission is taken down. The picture on the right shows Number 5 Abbey Green. At this small scale, there is nothing visible. 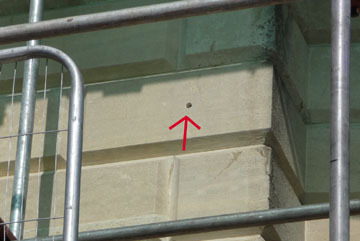 But under magnification, it is apparent that when the scaffolding was taken down, nobody thought to repair the holes (that should never have been drilled in the first place). Rainwater will penetrate these holes and gradually soften the surrounding stone, and then a sharp frost is likely to crack pieces of stone off. This time it is the Assembly Rooms, which is also a Scheduled Ancient Monument as well as a Grade I listed building. 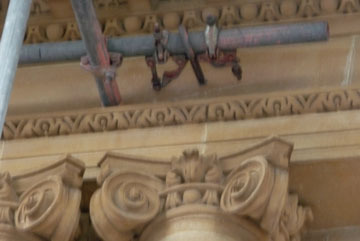 It is not easy to get a clear close-up photograph of these fixings, but from the street it is plain to see that they are drilled into the stonework. The culprit this time is Advanced Scaffolding, a misnomer if there ever was one! There is nothing advanced about showing contempt for the regulations designed to protect heritage, in the pursuit of a quick and easy installation using the minimum of materials. [18/4/10] On World Heritage Day, the National Trust was permitting free entry to the Assembly Rooms, and had provided staff who could talk about the building, its importance and its history. They described the building as owned by the National Trust but looked after by the council. But when asked whether they regarded drilling holes in the facade for scaffolding mounts as "looking after" they were unaware that it had happened. They didn't sound happy about it either. Our next example is in Broad Street, where Number 6 bears the fixings pictured right (where the offending company MAPLE can be read). 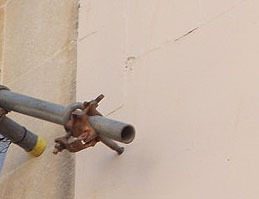 There is another similar fixing ring further along the building (see picture below). Again we stress that this is not a characteristic that is universally applied. 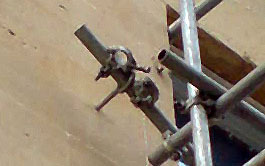 The same company erected scaffolding in Milsom Street (at No.22, Moss Bros) without attaching it to the building by this method. This incident was reported to Enforcement and we were allocated case number 09/00710/UNDEV. And it is S.N. Scaffolds who are the villain of the piece on another location of concern: outside Castle Galleries on the corner of Burton Street and Upper Borough Walls. 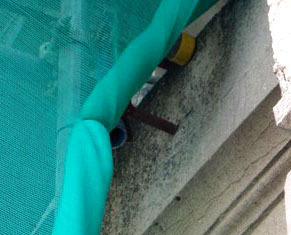 The picture on the left shows the location of the fixing drilled into the wall, highlighted by the yellow box because it is not easy to see through the red netting. The wall alongside it is very clearly not sound. Not only is a long crack visible, but there are also a couple of metal strips across it. These look too flimsy to hold the wall together, so we guess that they are there simply to detect whether the wall crack widens. The picture on the right shows how to add insult to injury! A vertical line on the stone shows the boundary between Castle Galleries (Number 5) and the West Cornwall Pasty Company (Number 4A). So S.N. 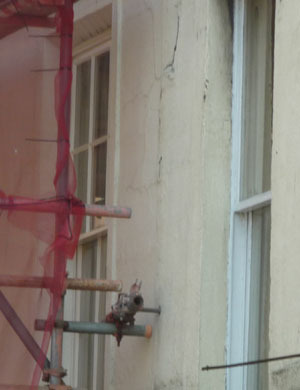 Scaffolds have not only drilled holes in a listed building without listed building consent, they have left the cost and responsibility for repairing the holes with the business next door to the one that wanted the scaffolding erected, should repairs be enforced in the future. We don't imaging the West Cornwall Pasty Company gave permission for that damage to be done to their premises; we wonder if they even know it has happened? The next offender is in Church Street, just off Abbey Green, and our pictures show what is left after the scaffolding has been taken down. This time a fixing ring has been left in the stonework. Attached to that ring is a green label. We wonder if that label is intended to show ownership, so that rival scaffolding companies are warned not to use it? It is almost exactly the colour that Maple used on their scaffolding in Broad Street (see pictures near the top of this section. Regardless of who left it there and why, it is an unacceptable addition to the appearance of a listed building and we hope that its removal and the repair of the resulting hole is quickly enforced. 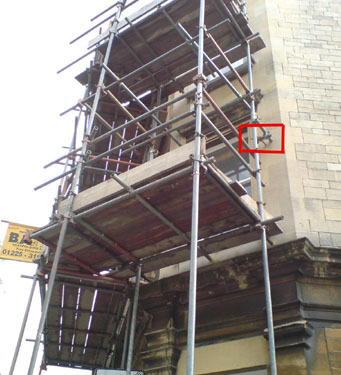 [18/9/10] The scaffolding company who drilled into the building pictured on the right is Coll Scaffolding Ltd, and one of their drilled fixings is highlighted by the red box. 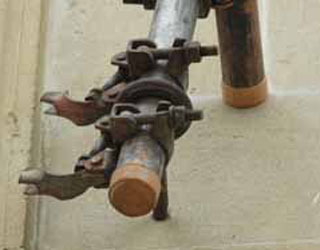 A close-up of the fixing (pictured left) shows a very similar attachment arrangement to that used by other companies. We will check what has been left behind once the scaffolding comes down. It is worth noting that the second set of scaffolding in the distance in the right hand picture is for an almost identical building yet that one (by Maple according to the sign) has been checked for us and no drilled fixings have been seen. We hope to photograph that one before it is taken down. The Royal York Hotel is shown in the English Heritage list as George Street (South Side) but its address according to the council Street Register as 1-2 York Buildings, George Street. 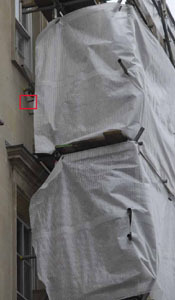 It is not easy to see how many fixings there are to the stonework because of the shielding over the scaffolding, but at least one fixing is in place, highlighted by the red box in the photo on the right. 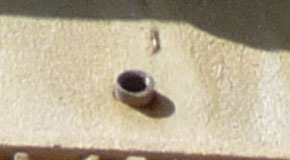 In the magnified section, the bolt is clearly embedded in the stonework. MG Scaffolding are the offending company. 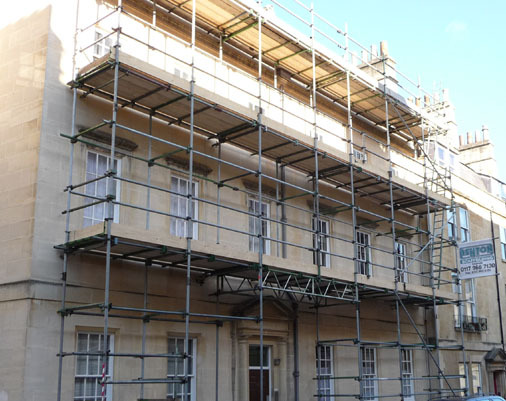 On 1 March we reported the scaffolding outside and attached to 27 Great Pulteney Street to Enforcement as a damaged Grade I listed building. On 19 March we received a reply saying no action would be taken. 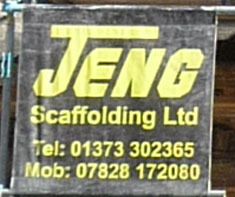 We have not so far traced a photograph of this scaffolding, but we include the address here for completeness. There are several scaffolded buildings in Great Stanhope Street, but this picture (when magnified) shows the address on a door, Number 5. 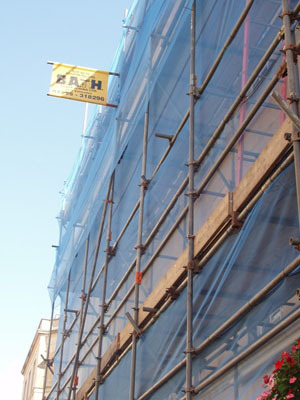 The company concerned, Ashton Scaffolding, hasn't previously come to our attention. But what makes their installation particularly noteworthy is the sheer number of fixings which have been drilled into a Grade II listed building without seeking Listed Building Consent. They have used far more fixings than any other scaffolding company for a similar sized set of scaffolding. The pictures to left and right show just two of about a dozen fixings in this section of scaffold. Further along the street are other buildings scaffolded, apparently by the same company because the style of fixings is the same, which also have a very large number of fixings. The fixings are all of the metal sleeve type which can cause serious cracking in the rear of the stone, and some of the other fixings (not photographed) are drilled into the mortar joints, which are quite likely to damage the stone edges. We were informed that scaffolding has been erected both front and back of this building. 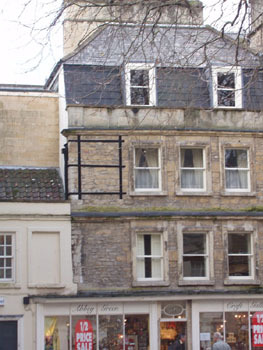 Both sets have been erected by the same company, Frome Scaffolding, but curiously only the front has been fixed by drilling into the stonework (shown by the red box on the main picture; there is a similar fixing at the other end of the scaffolding). We could not see any similar fixings at the rear. The front of this building is high quality dressed stone ashlar. The rear is coarse rubble stone. The fact that the scaffolding company chose to damage only the best stone and not the lower grade stone seems particularly perverse. The building name Danvers House has been used because this building has been scaffolded more than once under different business names. 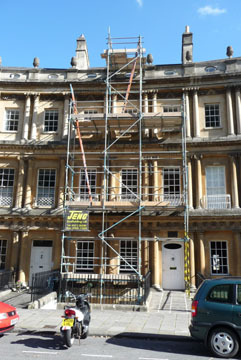 The scaffolding pictured left in December 2009 has now been removed and we have photographed the retainer that the company left screwed into the Grade II listed facade. Magnifying the whole building picture on the left reveals that the company in this case was called SELECT. Grade I listed buildings are sites of exceptional historic interest and only 2% of listed buildings fall into that category. So it is with surprise (and disgust) that we noticed that being rated as Grade I gave no protection from indiscriminate drilling for Barclays Bank (left) and the Sofa Workshop (below), both in Milsom Street. We have identified the drilled fixings with red boxes in these photographs. In both of these cases the walls look sound and the fixings do not look a Health and Safety hazard. However, Government policy is that alterations to a listed building should be a careful balance between the desirability of the alterations and the duty to preserve the nation's built heritage. 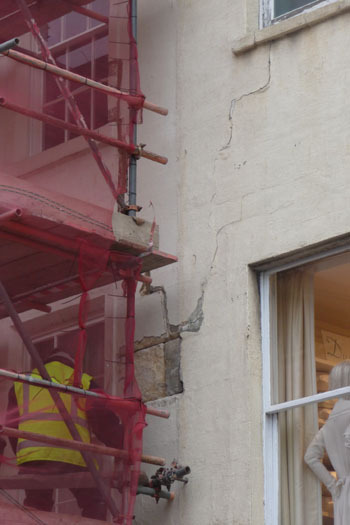 Given that Milsom Street is of great historic importance (hence its Grade I rating), drilling holes in the facades is not only unnecessary, it is vandalism. Once again it is S.N. Scaffolds who are the villains. Grade I listed buildings are sites of exceptional historic interest and only 2% of listed buildings fall into that category. 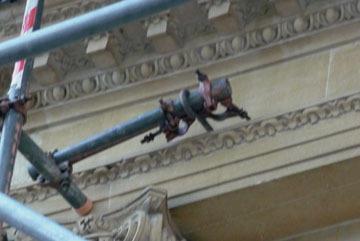 So when we were alerted that Norfolk Crescent was being drilled for scaffolding we went along to take a look. By the time we got there, the scaffolding was installed. The picture on the right shows Numbers 12 and 13 covered in scaffolding. The advertising notices are not easy to read in the photograph, but the lower one identifies the landlord, Knightstone Housing Association Ltd, and the upper one advertises S.N. Scaffolds. There is a pending Listed Building Application for these addresses, 10/02985/LBA, which has not yet been given a decision. The planning documents include a Heritage Statement where we read: The front elevation of Norfolk Crescent is characterised by the rusticated stucco on the ground floor with fine ashlar above. The elevation is in exceptional condition with very few alterations to its original form. Consequently any changes would be detrimental to the elevation due to the loss of uniformity. 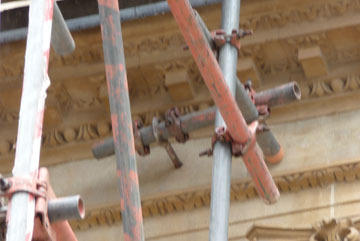 Given that statement, it is possible that the Case Officer might have imposed a condition preventing the "fine ashlar" from being drilled (there are other methods of making scaffolding safe), but this scaffolding was erected before a decision notice was issued, which forecloses that possibility. Yet none of the neighbouring properties have drilled holes, so there is now a loss of uniformity. Further along the Crescent similar scaffolding with similar signage has been erected outside Numbers 17 and 18. Once again there is a pending Listed Building Application for these addresses, 10/03091/LBA, which has not yet been given a decision And once again the applicant includes a Heritage Statement where the quality of the front is highlighted: The front elevation retains its original uniformity and is of exceptional significance. And yet once again this "exceptional" facade has been drilled to fix scaffolding, foreclosing the option for the Case Officer to impose a condition preventing the elevation from being drilled. 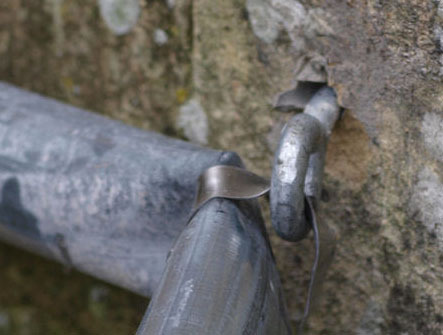 We note too that the fixings are the metal type, which can cause damage to the rear of the stone and can rarely be removed, rather than the rubber sleeve type favoured by property services (but only for use in existing holes) which grip by friction and can be easily removed when no longer required. This example is in Northgate Street, outside the White Company. 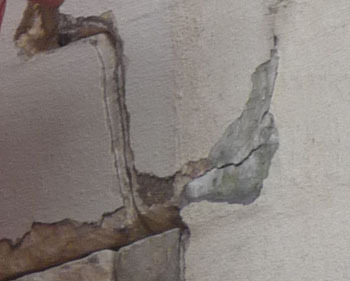 In the picture on the left, you can see that the fixings have been drilled into the wall, even though above the fixing there is an obvious crack. When we went back a few days later and took the picture on the right, workmen were working on that part of the wall, and it looks as though they intend to do some work on the cracks. With the render removed, the condition of the wall underneath is now visible. And the third picture on the left shows that this isn't a wall that just needs repointing, this is a wall where the cracks are across the ashlar blocks. The scaffolding is supposed to be erected so that it is safe in high winds. Given the condition of the wall, it is very likely that if the fixings were to be stressed by high winds, part of the front of the building would collapse with the scaffolding attached to it. 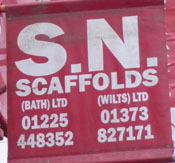 The sign on the scaffolding says S.N. Scaffolds. 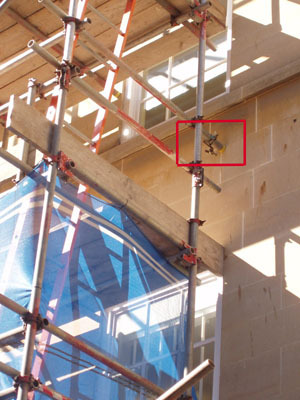 Not only are they breaking the law by drilling into a listed building without obtaining listed building consent, but they run the risk of a Health and Safety prosecution if anybody is injured by scaffolding or masonry pulled loose by the scaffolding. We didn't note the address in Northumberland Passage at the time, but we will fill in the details later. 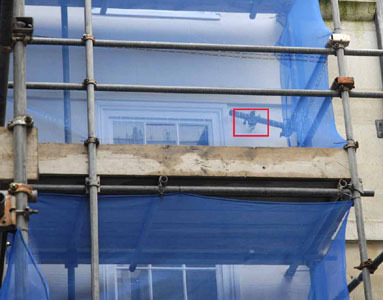 Because of the blue shielding round the scaffolding, it is not easy to photograph the offending fixings, but they are clearly visible to the naked eye, and have been marked by the red box in the main picture on the right. 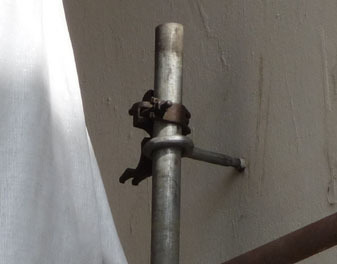 However, even with the visibility limitations, the fact that the scaffolding fixings have been drilled into the listed wall can be seen in the magnified picture on the left. This time, the offending company was SN Scaffolding. We didn't note the address in Princes Buildings at the time we took the photographs, but we will attempt to add this information later. Princes Buildings are by John Wood (The Younger). The scaffolding has been taken down from Princes Buildings, leaving the holes behind. We have counted six (there may be more but six are obvious to the naked eye), one of which appears to have a metal sleeve left in the hole. Two of the holes show clearly in the photograph on the right, and we have magnified each of these in the pictures to the left. It is apparent that Ace Scaffolding made no attempt to patch the holes when they removed their scaffolding. This picture is from our archive and was taken in Queen Street. At the time we did not take a picture of the full scaffold or note the name of the company. We know that each company identifies their scaffolding by coloured paint markings and could recognise their installations from these pictures, but we don't want to guess in case we accuse the wrong business. It is included here though as part of our photographic record. 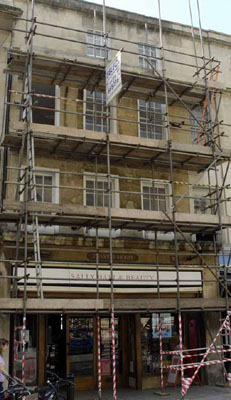 This is a double fronted shop and a large expanse of scaffolding covers it, bearing a sign advertising Bath Scaffolding. It is not the former River Island shop that bears the damage however, but those either side. In the detailed pictures, the River Island frontage stands slightly proud of its neighbours, so the fact that the drillings are in the neighbouring properties is plain to see. Now look at the cracks in the masonry around where the scaffolding company has drilled. They do not inspire confidence, given the amount of leverage that a pole of that length could exert. 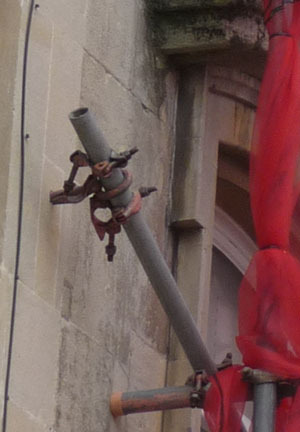 Bearing in mind that these fixings are supposed to prevent the scaffolding collapsing into the street in the event of a gale, we have to wonder whether such stresses would pull the stone from the building and be carried with the scaffolding to the ground. It is for that reason BS5973 specifically warns that if fixings to the facade are proposed "it is also crucial to assess whether the building fabric can support such loadings", and we wonder if that crucial preliminary step was actually carried out. This building has newly erected scaffolding by Unite Scaffolding Ltd, and their advertising sign shows a Manchester phone number, so they are a long way from there and we can only assume that Vodafone have a nationwide contract with them. Once again the wall has been drilled, as shown by the red box on the main photograph. 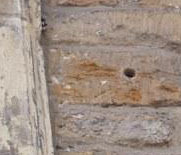 Although this type of fixing, which has not previously been seen in Bath, uses a smaller eye, the drilling into the stone is of similar size to the fixings used by the more local companies (see picture left) and will leave a similar sized hole. Of particular interest is the white mortar around the drilled stone, showing that this part of the wall has had a recent repair. 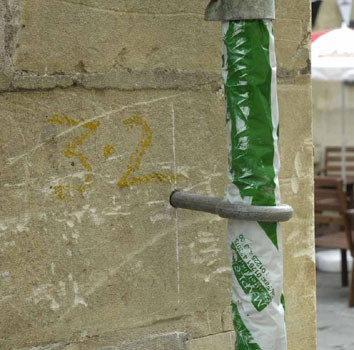 It poses the question of whether that particular stone is mounted securely enough to meet the requirements of BS5973. [7/3/10] Once again, scaffolding has been erected, with fixings drilled into a listed building. Once again the culprit is SN Scaffolding, this time working in conjunction with NKS Contracts, according to the signs hung on the scaffolding. We can find no extant planning permissions for this address (16 The Circus), so we assumed that routine maintenance was in progress. In close-up the workman on the scaffolding appears to be installing protective plastic sheeting, so this could be in preparation for painting. The drilled fixings are marked by yellow boxes in the picture on the right. In the picture on the left is a close-up of the lower one. There are similar drilled fixings on the far side, adjoining property number 15. This is a Grade I listed building, the masterpiece of John Wood, being treated as though it is any old brick wall. This is nothing more than vandalism. English Heritage provide guidance on methods of securing scaffolding without intrusive drilling, and that guidance should have been followed on such a sensitive site as this one. 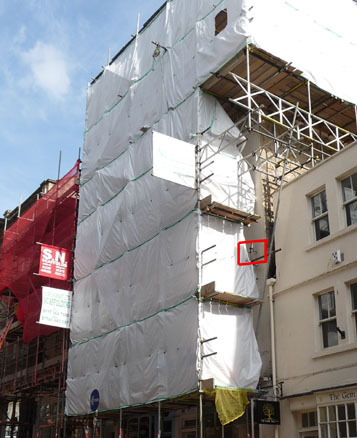 [13/9/10] When the scaffolding was taken down from Number 16, we spotted that one of the metal sleeves had been left half in and half out of the stonework, highlighted by the red box in the picture on the left. Our close-up shows exactly what is left behind. Because metal shows a much greater amount of expansion and contraction as temperatures change than stone does, it is only a matter of time before the effects of the weather on that metal sleeve damages the stone facing. It looks as though SN Scaffolding, working in conjunction with NKS Contracts, has no respect at all for the historic fabric of The Circus. The scaffolding at Number 16 having gone, at the time of writing, two new sets of scaffolding have been erected at other addresses in The Circus. Once again, scaffolding has been erected, with fixings drilled into the stonework. The photo on the left is of the fixing drilled into Number 3; the photo on the right is of the fixing drilled into Number 21, where the scaffolding extends across Number 22 as well. We wonder how many more addresses in The Circus are going to be drilled without listed building consent, and why neither English Heritage nor the council seem concerned. 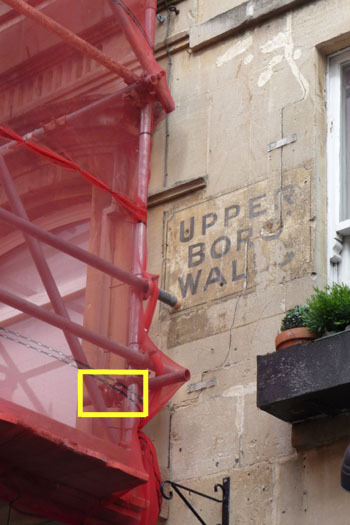 It does prove though that if they can do it, so could the others who treat Bath's listed buildings in such a cavalier fashion, and that such wanton damage could and should be enforced. This picture is from our archive and was taken in Trim Street. Scaffolding has been erected outside the Dune shop. This time the drilled fixing is high up on the building, as the red box on the picture on the right shows. It is not easy to see from the ground with the naked eye, but it is there, as a telephoto lens reveals, see picture on the left. 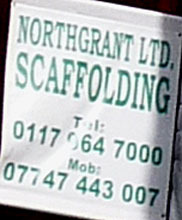 And the sign attached to the scaffolding shows that S.N Scaffolds are the culprits on this occasion. Victoria Bridge is owned by the council and was recently closed to pedestrians by the council. Pedestrian barriers were put up to block the way, and without applying for Listed Building consent, anchors were inserted in the stonework. You can see in the picture, that this did the stone no good at all. The barriers have been removed at the time of writing this, but the holes have not been repaired. It is included here as part of our photographic record. The signs on the right of the main picture have reflected the sun, but by digitally enhancing the contrast, the name Northgrant Ltd becomes visible. Both companies have used drilled fixings and we can find no listed building consent for them. One of Northgrant's fixing is highlighted by the red box in the main picture. Close-up (below left) it is obviously drilled. It was rather more difficult to get a clear view of the SN fixing but the best close-up we could get (right) also shows it is drilled. 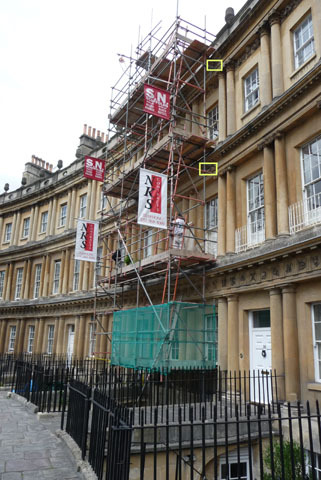 Taken down between the photograph being taken and being published here, but nevertheless deserving its place in our rogues gallery, is this example of scaffolding bearing a sign advertising Bath Scaffolding. The red box highlights one of the drilled fixings. 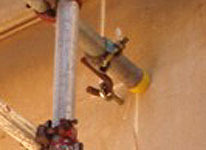 That fixing is shown in close-up in the picture on the left. It is quite clearly a drilled fixing, made without listed building consent. The scaffolding pictured on the left was recently erected outside the "Posh Or Not" shop. 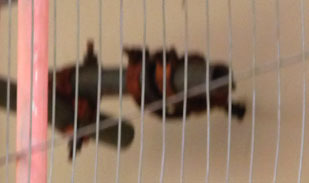 There is no shielding in place here, and the fixing to the stonework is plain to see in the red box on the left hand photo, and in the magnified section on the right. 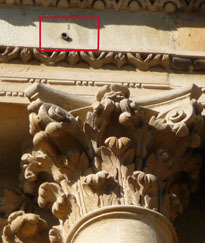 On this occasion, it was Bath Scaffolding that drilled the holes in the stonework. 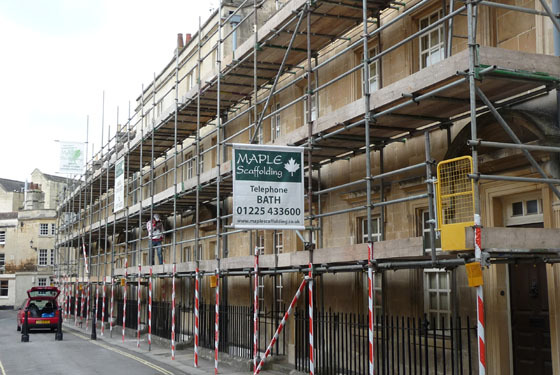 [18/9/10] When we saw this huge array of scaffolding along almost an entire side of Beauford Square (starting from Number 14) and the Maple Scaffolding sign, we feared the worst. But having examined the entire length we couldn't find a single drilled fitting. Instead, it is secured using a combination of the non-intrusive methods recommended by English Heritage. So well done Maple. 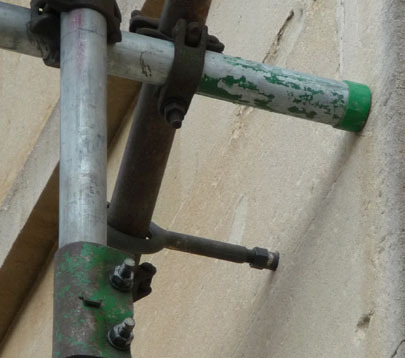 You can secure scaffolding without drilling into the stonework. Please do it more often. 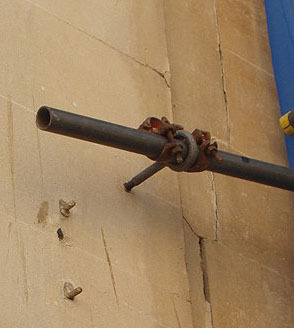 We originally reported [3/9/10] that one of our members reported that scaffolding was being erected outside the Guildhall and that a number of holes appeared to have been drilled into the stonework. By the time we got there with a camera, dense green netting covered the scaffolding, and although it was possible to see by eye that there were several drilled fixings into the stonework, photographs through the netting were too blurred to use. It was possible to photograph one fixing round the edge of the netting though, see picture left. That photograph showed the same type of fixing as has been seen elsewhere around Bath and what looked like a crack showing on the underside of the drilled stone and we wondered whether the act of drilling created a crack in the stone. Just over a week later we reported that a further set of scaffolding has been erected, to the right of the previous scaffolding. 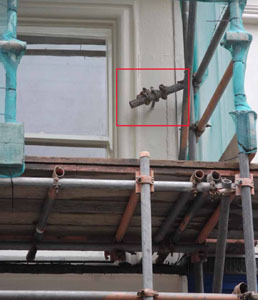 [26/9/10] Then we received a communication from a council officer correcting our wrong assumptions and asking us to post on the website the following response: "No holes have been drilled by the scaffolding contractor. 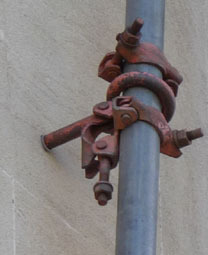 All fixings utilise existing holes and are subject to the Council's specification on the Guildhall works (an extract is below). 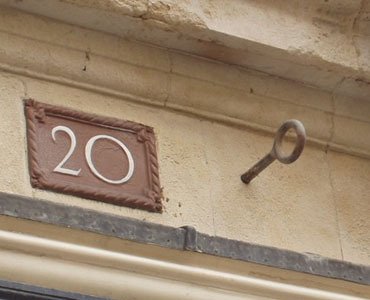 The crack which appears in the photograph is natural vein present in Bath stone. The Council has developed an extensive system of control to ensure that these essential works are carried out with the maximum level of attention to the conversation of the building." We were also provided with an extract from the works specification: "The method of tying the scaffold to the building is to be the subject of discussions with the Contract Administrator prior to the work being carried out. No intrusive fixings are to be used without prior written authority. Wherever possible non-intrusive methods are to be used. Where face fixings are necessary only NTA Temporary Scaffolding Anchors will be allowed. 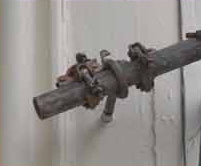 An assessment must be made of the nature of the surface being tied to and sufficient pull tests carried out, at least 1 in 5, to ensure that the scaffold structure is safe to hand over." 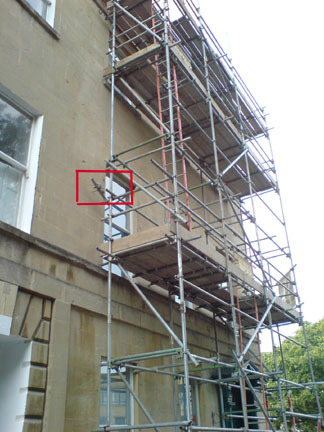 That specification requires proper safety tests before the newly erected scaffolding can be used. Also, the wording is sufficient to prevent any new holes being drilled without explicit permission, and our subsequent inspection shows that there are existing mounting points around the building to allow the temporary anchors specified to be fixed. The picture on the right shows two such mounting points (arrowed) which were not needed this time. These two are capped to keep out the weather. 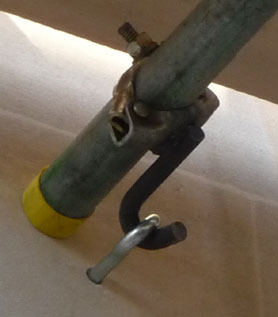 We also noticed an uncapped hole under another part of the scaffolding, arrowed in the picture on the left. We have not so far traced a past planning permission that permitted these holes to be drilled, but they do exist and their existence does confirm that there should be no need to drill any further holes now or in the future. 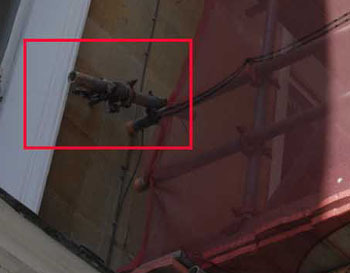 After reports from members that they had watched holes for fixing scaffolding being drilled in other buildings around Bath, it was a reasonable (though erroneous) assumption that the same thing had happened at the Guildhall when the same type of fixings were seen. We are are grateful for the correction and we are happy to set the record straight. 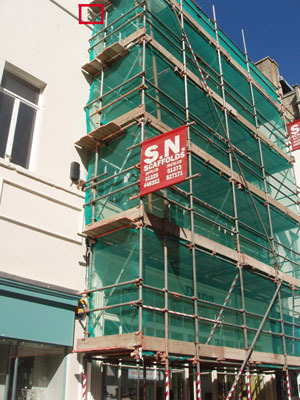 [13/9/10] Number 27 has had scaffolding erected. However, credit where credit is due, we had a good look and this scaffolding company has managed to erect their scaffolding from street to parapet without drilling a single hole in the listed building. So congratulations to them, and we are happy to give them a plug with an enlargement of their company advertising from the overview picture on the left.